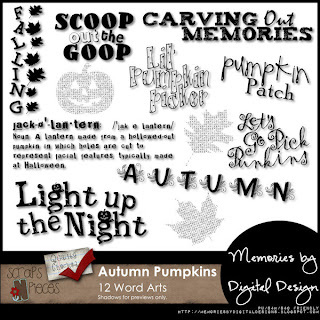 Memories by Digital Design: Want to Win some Word Art? Want to Win some Word Art? You want to win some word art? 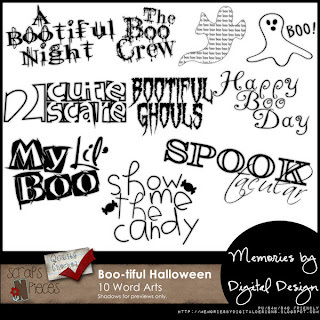 How about some awesome Halloween word art? Leave a comment here and let me know what costumes will be worn in your house this year for Halloween. One lucky winner will get their choice of Autumn Pumpkins or my soon to be released pack, Boo-tiful Halloween. One blog winner will be announced on Sunday. If you want an extra chance of winning, head on over and "like" my Facebook page, then comment on my giveaway post there too for a chance to win on Halloween!! Shh...here's a little secret. Boo-tiful Halloween is already in the store, just won't officially release until Sunday, 10/30. If you can't wait, head on over now. We'll have a shark and Sid the Science Kid here! We will have an M&M, an Army guy and a witch (because I am so good at it). I will have a little Winnie The Pooh! We'll have a family of pirates.